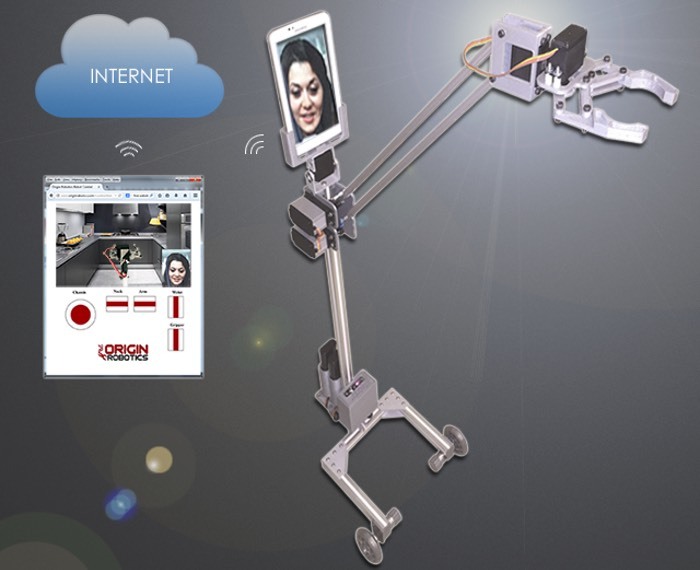 Android tablet owners that are also looking for an affordable telepresence robot might be interested in Origibot, that has been designed be the world’s first affordable telepresence robot with an articulated arm and gripper option. The Origibot telepresence robot project has launched over on the Indiegogo website and provides both two way audio and video but also full control of its five degrees of movement. Check out the video below to learn more. “ORIGIBOT is a fully robotic platform that pairs with your Android phone or tablet (running our free App) to become a complete telepresence solution. You connect remotely to ORIGIBOT from anywhere in the world on most any device with an Internet connection (Android, iOS, Windows, Mac) via our secure cloud service. Since it uses WebRTC technology, the web interface is simple and light (doesn’t require any additional plugins or java applets). It’s also fast and responsive with minimal lag over broadband connections. Not only do you have two-way audio and video, but also full control of the robotic platform, arm, and gripper. How awesome is that? A full 5 degrees of freedom (including the robot base) to interact with the remote environment! For more information on the new Origibot jump over to the Indiegogo website for details via the link below.